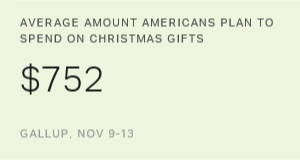 PRINCETON, N.J. -- Gallup's November measure of U.S. holiday shopping finds Americans expecting to spend an average $752 on Christmas gifts this year. That is down from an expected $830 in spending during the 2015 holiday season, but matches the average for the last seven years, since 2010. Since 2010, the first full year after the end of the 2007-2009 recession, Americans' November holiday spending estimate has averaged $751, with little variation. The highest was the $830 recorded last year and the lowest was $704 in 2013. According to the latest poll, conducted Nov. 9-13, 30% of U.S. adults expect to spend $1,000 or more on Christmas gifts. At the other end of the spectrum, 23% will spend less than $250 while a third plan to spend something in between those levels. Roughly one in 11 Americans (9%) now say they don't celebrate Christmas or won't be spending anything. When one excludes from the calculation those not purchasing any gifts and looks only at gift purchasers, the average amount U.S. consumers plan to spend on gifts this year rises to $831. 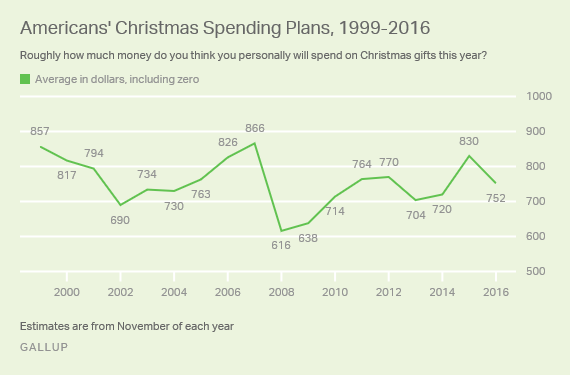 The latest findings are statistically similar to Gallup's initial measure of 2016 holiday spending plans, conducted in October. 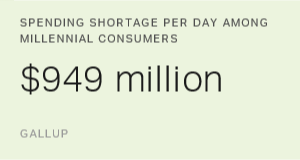 At that time, Americans planned to spend an average $785 on Christmas gifts. The stability in the November figures is notable in that they were collected in the first few days after the presidential election -- a time when Americans were expressing heightened confidence in the economy. However, that hasn't translated into an increase in holiday spending plans. Americans' current holiday spending intentions offer a relatively positive signal for U.S. retailers this season. Gallup's analysis of the relationship between Americans' prior holiday spending intentions and actual U.S. holiday sales (as calculated for each year by the National Retail Federation) suggests 2016 retail holiday sales will most likely increase by a bit over 3% versus 2015. That would not be as strong a performance as the 5% to 6% increases seen before the Great Recession, but at least matches the average in recent years. Results for this Gallup poll are based on telephone interviews conducted Nov. 9-13, 2016, with a random sample of 1,019 adults, aged 18 and older, living in all 50 U.S. states and the District of Columbia. For results based on the total sample of national adults, the margin of sampling error is ±4 percentage points at the 95% confidence level. The margin of sampling error for the spending mean is ± $72 at the 95% confidence level. All reported margins of sampling error include computed design effects for weighting. On Cyber Monday, major chains frustrated shoppers when their websites failed to keep up with demand. Disengagement could follow.